Members’ growing interest and expertise in Nature Photography! Very many thanks to Mike Lawson, our Secretary and natural history enthusiast, for a wonderful evening on Thursday 22nd August. As a consequence of Mike’s ten tuition days, a record number of over 40 prints were submitted from members! Mike would like to thank all members who took part, making the evening a huge success! 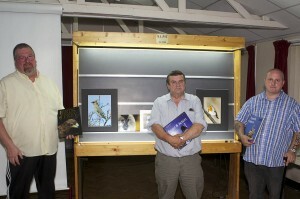 Here are the worthy winners L to R (voted by members) – Mal, Brian and Joe.